Stems: Erect, stiff, ascending branches near top. Leaves: Alternate, stiff, linear to linear-lanceolate, .4 to 1.2 inches long, about .1 inch wide; tips pointed to tapering pointed; margins usually entire. Inflorescences: Panicle, open, terminal on each branch. Flowers: .5 to .75 inch across; sepals lanceolate, margins with minute, gland-tipped teeth; petals 5, yellow with brown to red coloration near base; stamens 5; pistil 1, with 5 segments. Fruits: Capsules, elliptic, thin-walled, 5-segmented, each segment 2-seeded; seeds small, brownish. Habitat: Prairies, disturbed areas and open, wooded hillsides; sandy soils. 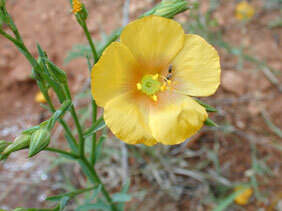 Toxicity: Stiffstem flax is said to contain saponin, which can cause livestock poisoning, particularly in sheep. Comments: The petals usually drop after one or two days. Closely related to Berlandier's flax .